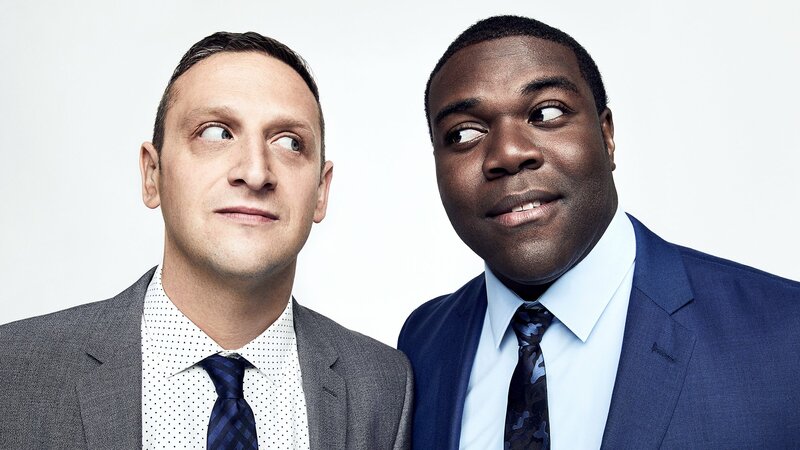 "Detroiters" stars best friends and Detroit natives Sam Richardson and Tim Robinson as fledgling ad men in the Motor City. Lacking the resources to challenge the money, connections and talent of big corporations, the guys rely on relentless ambition to build a local advertising empire. And no matter what happens, Tim and Sam's love for each other and their city never wavers. Tim and Sam, two low-level Detroit ad men, try to secure a big ad campaign with Chrysler, resulting in disaster. After a client inspires Tim and Sam to work less and live more, the guys buy a motorcycle. Sam starts dating a local councilwoman who thinks he's a prostitute. Tim and Sam try to convince an old Motown legend to sing a jingle for a local wig company ad. Sam struggles to come up with a worthy speech to make at his father's 60th birthday party. A new tech company moves into Tim and Sam's building, disrupting their daily flow; Tim's crush. After getting fired by a furniture store client, Tim and Sam try to make an ad. Tim and Sam's employees threaten to quit due to a lack of health insurance. Tim's father ,“Big Hank,” unexpectedly returns from the insane asylum under suspicious circumstances. Tim and Sam discover that the Chrysler executive they ran over has led a terrible life ever since.